Database relations are designed so that they are neither partial dependencies nor transitive dependencies, because these types of dependencies result in update anomalies. functional dependency describes the relationship between attributes in a relation. For example, ‘A’ and ‘B’ are attributes in relation R. ‘B’ is functionally dependent on ‘A’ (A B) if each value of ‘A’ is associated with exactly one value of ‘B’. The left_hand side and the right_hand side functional dependency are sometimes called the determinant and dependent respectively. 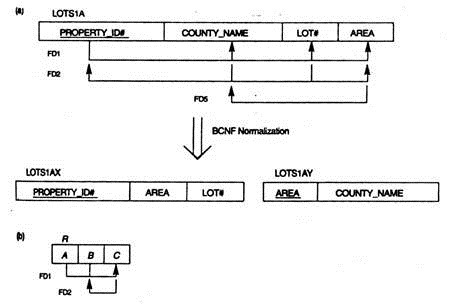 A relation is in BCNF if and only if every determinant is a Candidate key. The difference between the third normal form and BCNF is that for a functional dependency A B, the third normal form allows this dependency in a relation if ‘B’ is a primary_key attribute and ‘A’ is not a Cndidate key. Where as in BCNF. ‘A’ must be Candidate Key. Therefore BCNF is a stronger form of the third normal form. The PRODUCT scheme is in BCNF. Since the prd# is a candidate key, similarly customer schema is also in BCNF. The schema ORDER, however is not in BCNF, because ord# is not a super key for ORDER, i.e. we could have a pair of tuples representing a single ord#. here ord# is not a candidate key. However, the FD ord#->amt is not trivial; therefore ORDER does not satisfy the definition of CNF. It suffers from the problem of repetition of information. This redundancy can be eliminated by decomposing into ORDER1, ORDER2. 16 possible area values. This representation reduces the redundancy of repeating the same information in thousands of LOTS1A tuples.